This is the third in a three-part series making the case that the development of the biotech traits for insect resistance and herbicide tolerance are the most substantial innovations in sustainable agriculture in the last three decades. In the first part, I laid out the context in which I believe they should be assessed relative to other innovations competing for the crown. In the second part, I examined the data and evidence of their overall environmental impacts. Here, I’ll make my closing argument after looking at the impacts on China, India, Pakistan and South Africa. Despite the myth that the adoption of Bt cotton in India has led to a spate of farmer suicides, the story of Bt cotton in India has been one of robust success. In 2015, 25 million acres of Bt cotton were planted in India, 95% of total cotton plantings. Let’s build this from the ground up, starting with pesticide poisonings in the region. What have been the other impacts? In China, researchers looking at 15 years of data on cotton production saw a substantial decrease in pesticide use compared to non-Bt cotton. The decrease amounted to a saving of $105/hectare, or 50% of the pesticide use in 1996, the final year before the adoption of Bt cotton. 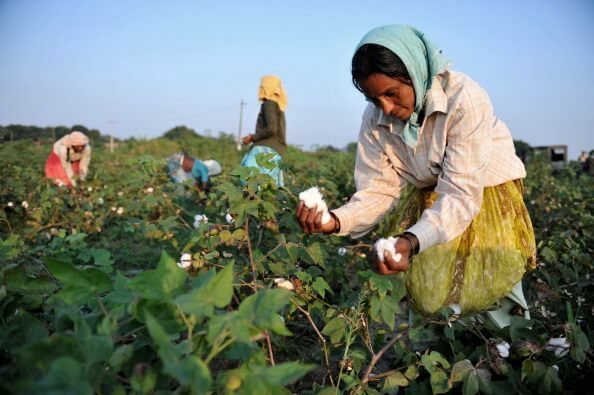 Similarly, the adoption of Bt cotton led to a 17.25% reduction in labor compared to 1996. One of the interesting things they found was that insecticide use continued to decrease steadily through the 15-year period. Rather than the uptick predicted by resistance developing in insect pests, pest populations were reduced to such a degree that they presented less of threat over time. With Bt cotton adoption, Chinese farmers saved 4.12 billion yuan ($655 million) on pesticide use and 8.70 billion yuan ($1.4 billion) on labor use. Researchers calculated the total economic benefit that Bt cotton generated to be more than 33 billion yuan ($5.2 billion) over the 15 years. In Pakistan, researchers found Bt cotton associated with 20% higher yields despite lower insecticide applications. Using a farm survey and choice experiment of Pakistani cotton farmers, a 2013 study took a stab at putting a dollar value on the health and environmental improvement associated with Bt cotton. Researchers found that farmers valued those effects at $79 per acre, with half attributable to health and the other half to environmental improvements. Combined with the explicitly economic average gains of $204 an acre measured previously resulted in aggregate benefits of $283 per acre, or $1.8 billion for the total Bt cotton area in Pakistan. 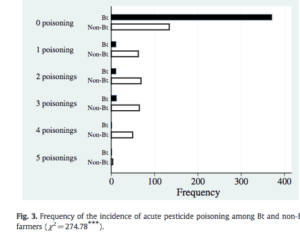 A 2014 study quantifying the economic impact of greater energy efficiency and lower environmental pesticide impacts in Pakistan found Bt cotton 37% more environmentally friendly on those combined measures than non-Bt cotton. The researcher calculated the economic value of that improvement at $320 million. 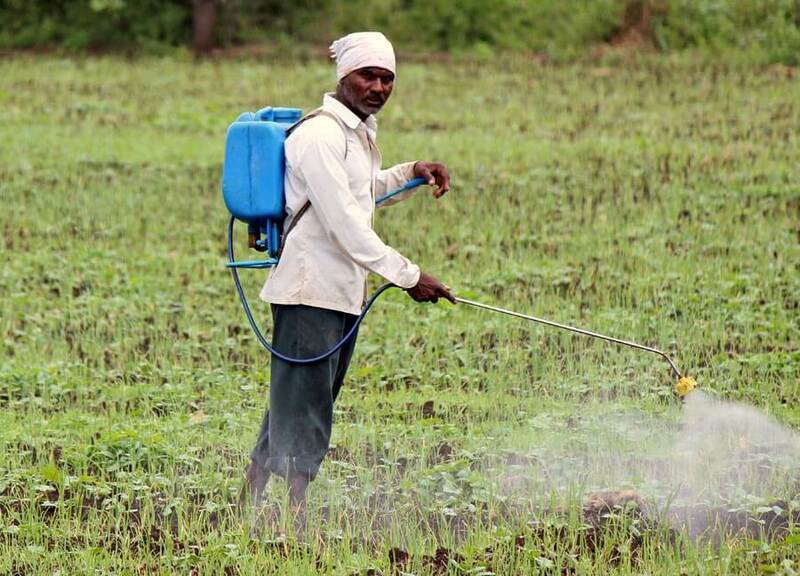 In India, researchers observed a 24% increase in yield per acre for smallholder Bt cotton farmers due to reduced pest damage and a 50% gain in cotton profit among smallholders between 2002 and 2008. They further observed the gain in profits translated into 18% higher consumption expenditures, a common measure of household living standard, during the period 2006–2008. In a 2013 study, researchers found that increased income cut food insecurity by 15–20%, while significantly improving calorie consumption and dietary quality. 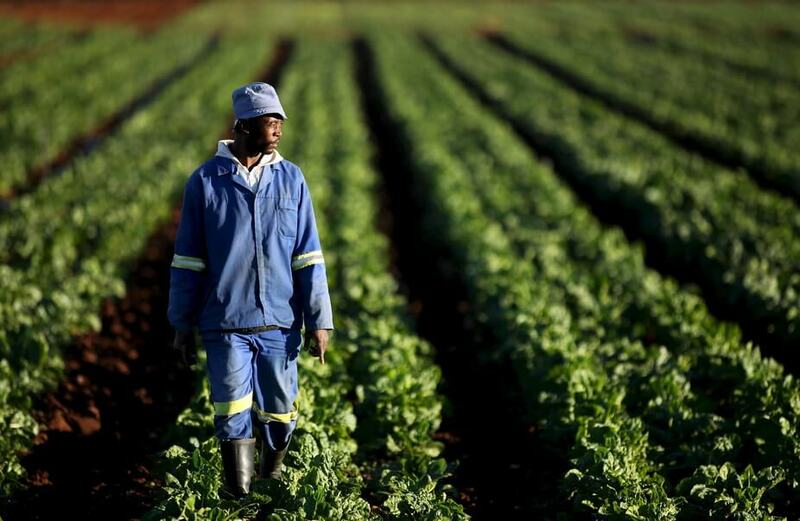 In South Africa, the results of a 2004 study on farm income and inequality were particularly stark. 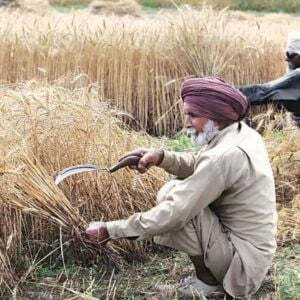 “Bt growers had significant benefits compared to growers of non-Bt cotton in terms of gross margin over the three seasons. All other things being equal, Bt growers had a increase in gross margin of SA Rand 562/ha over growers of non-Bt. This is a significant sum. Assuming a typical daily wage of SAR 10/day in South Africa this equates to almost 2 months paid work. Of added interest is the finding that those with the smaller holdings appeared to benefit proportionately more from the technology (in terms of higher gross margins) than those with larger holdings.” The result of proportionately greater returns for smallholder farms brought down inequality significantly among Bt farmers and the benefits more evenly distributed among that group. 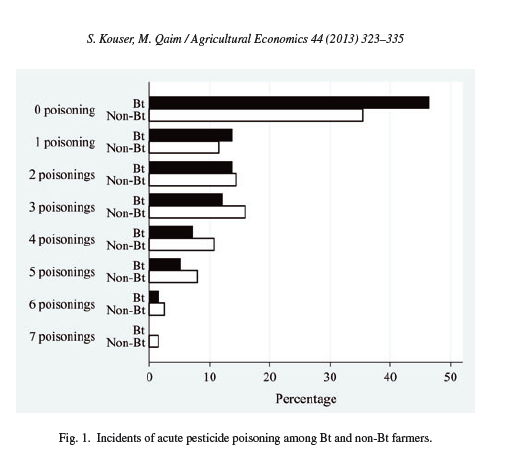 That paper also observed decreased bollworm insecticide use among Bt farmers. There is one major meta-analysis of the impacts of Roundup Ready and Bt crops that I didn’t include in tallying up the achievements of these traits. I bring it up now because, while I don’t think its a strong piece of research in measuring the impacts of the two main biotech traits, it is illuminating in looking at one of the more sophisticated objections to the way genetic engineering has been applied in agriculture thus far. On average, GE technology adoption has reduced chemical pesticide use by 37%, increased crop yields by 22%, and increased farmer profits by 68%. Yield gains and pesticide reductions are larger for insect-resistant crops than for herbicide-tolerant crops. 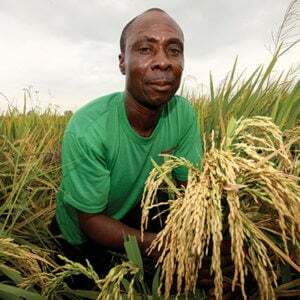 Yield and profit gains are higher in developing countries than in developed countries. I think that’s correct. I’ve seen these results touted uncritically far too often by people who should know better – including myself prior to reading Heinemann’s post. At best, what this meta-analysis shows is a correlation between GE adoption and major improvements in pesticide use, yields, and farm profits, but those improvements are bound up with a suite of technologies that biotech crops are often bundled with. However, Heinemann’s point undermines the critique of biotech in agriculture that I alluded to. The more grounded, more sophisticated critics of biotech in agriculture will often say that while the benefits of the technology can be narrowly demonstrated on measures like yield or decreased insecticide use, their objection is that these traits and commodity crops are part of a system that is environmentally harmful and disadvantages farmers in favor of the major seed and input companies. But what we are seeing the Qaim meta-analysis and Heinemann’s reframing, is that the suite of technologies that biotech traits come bundled with, elite germplasm (improved seed), irrigation, synthetic fertilizer, synthetic pesticides, etc work together to reduce pesticide impacts while improving yields and farm income. That “system” delivers better results than what it is replacing. Nor have we seen evidence of what some critics suggest, biotech lubricates the system and discourages more holistic, thoroughgoing solutions to problems. We have two very good natural experiments on that front. One of the first biotech crops to hit the market in mid-nineties was a Bt potato. The Colorado Potato Beetle is a major pest for potato growers and the Bt potato could have reduced insecticide use quite a bit in the production of America’s favorite vegetable. Anti-GMO environmental groups successfully petitioned McDonald’s to reject Bt potatoes. That collapsed the market for the seeds. In the intervening three decades, I’ve seen no evidence that production potato farmers went back to the drawing board to develop more holistic methods of insect control than they were using before. In terms of IPM, in 2016 the Southern Idaho Potato Cooperative contract included new language mandating a minimum of two years of alternate crops between potatoes. If that’s the revolution in sustainable potato production anti-GMO groups were aiming to pressure farmers into, mission accomplished. That’s a million acres in the US alone where we could have drastically reduced insecticide use, but we didn’t because of the objections of a particular strain of “environmentalists”. Likewise, the wheat growers trade group lobbied against the commercialization of Roundup Ready wheat around 2004 and Monsanto dropped their wheat program in 2005. 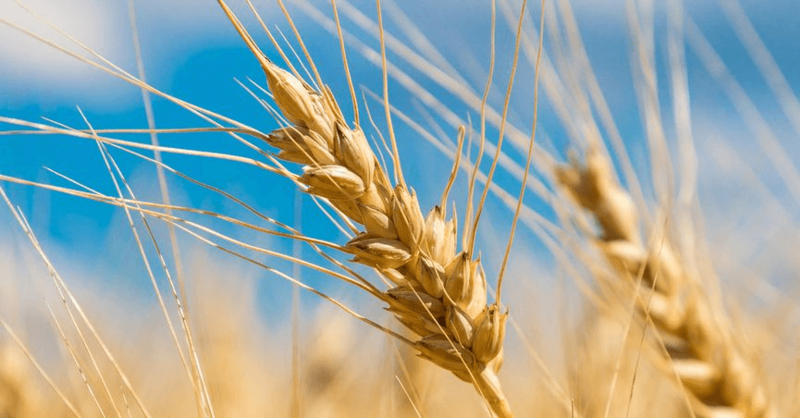 Because wheat figures so prominently in products like bread and pasta, they decided it wasn’t worth the headache of potential boycotts or disruptions to export markets. To my knowledge, wheat farmers continued controlling weeds with the same combination of herbicides and tillage they’d been using before. In the US alone that’s 50 million acres where we’ve already foregone the benefits of reduced tillage and improved an improved profile for herbicide use. 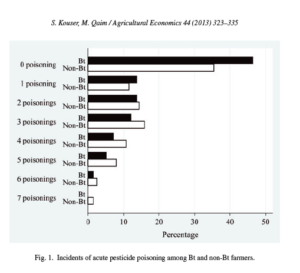 Instead, as we saw in the Kniss paper, herbicide use in wheat increased faster than in corn and soybeans. To be sure whatever system biotech commodity crops (or sets of overlapping systems) are embedded in is deeply flawed in many ways. The Dicamba debacle certainly revealed weaknesses in that system here in the United States. Monsanto had a supply of Dicamba resistant soybeans ready to sell, but the EPA delayed the release of a formulation of Dicamba approved for use in soybeans. Many farmers, facing severe yield loss from glyphosate resistant pig weed, went ahead bought the new seed and used other formulations of Dicamba, which was fine for them, but bad for their neighbors who didn’t have the new Dicamba resistant soybeans and saw some serious crop damage, as soybeans are normally very vulnerable to Dicamba. Then the EPA released the new formulation and that caused more problems. The system is far from perfect. No argument there. The global, industrial food system faces huge challenges in terms of greenhouse gas emissions, soil degradation and erosion, nutrient runoff leading to eutrophication and acidification of oceans and lakes (think of the huge deadzone in the Gulf of Mexico or the massive algae blooms in the Great Lakes), water shortages, and deforestation. The Roundup Ready and Bt traits have made marginal improvements on all of these fronts across hundreds of million acres. Are they revolutionary? Maybe, maybe not, you’ll have to judge that for yourself. Perhaps not compared to what we can imagine or what might come next. There are a number of innovations on the horizon that could turn out to be truly revolutionary for making agriculture significantly more sustainable. Plant meats that can scale to mass, global consumer markets and replacing vast quantities of animal protein sources would be world changing. Another area with room for vast improvement is the genetics of livestock in the developing world especially for cattle, as they grow to market weight much more slowly than in the US, meaning much greater methane emissions per pound of meat produced. 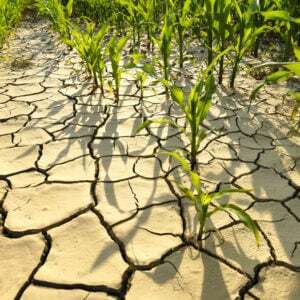 Bringing nitrogen fixation to grains would be revolutionary, especially for poor small holder farmers without access to synthetic nitrogen. Likewise efforts to make photosynthesis more efficient are likely to bear fruit sooner or later, seriously boosting yields. 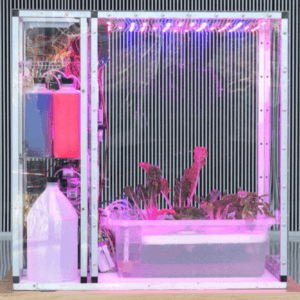 We aren’t far away from using AI and robotics to apply herbicides effectively, but in vanishingly small amounts, and that breakthrough could be easily eclipsed by weed control via RNA interference. But a lot of what needs to be done is lots of improvements on the margins using technology we already have – more riparian buffer zones and pollinator habitat, greater use of cover crops, more precision irrigation, greater investment in anaerobic digesters in livestock and poultry production. And when I look back over the last three decades, that’s mostly what we’ve seen. Aside from reductions in tillage due to improvements in the hardware necessary for no-till and various minimum-tillage techniques, the only cluster of innovations that I think are anywhere in the running for being close to Roundup Ready and Bt traits in terms of making agriculture more sustainable are precision and variable-rate application technologies for seeding and the application of fertilizers and pesticides. While great, those are clearly improvements on the margin. The most exciting, variable rate fertilizer application doesn’t reduce the amount of fertilizer significantly. It just assures that it’s applied more efficiently. That’s great, but it’s hardly revolutionary. I’m open to nominations, but I’m hard pressed to think of two innovations from the last three decades that have done more to improve the state of agriculture around the world.